Kentaro’s love for dance was brought about when he came to The Dance Collective 5 years ago and took part in a Hip Hop and Contemporary class taught by director Charisse Parnell and teacher Steve Martin. Kentaro credits this class and dance in general for building his confidence and changing his life. His hard work and passion were recognised when he was chosen as a TRIDGY hip hop crew member in 2014. With TRIDGY Kentaro had the opportunity to perform at Perth Battlegrounds and at the World Supremacy Battlegrounds held in Melbourne. In 2015 Kentaro was chosen as a member of hip hop crew The Society. Kentaro has a martial arts background and believes this has really enhanced his dancing through focus, strength and agility. 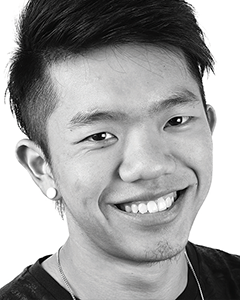 Kentaro is very excited to be a teacher at The Dance Collective this year and is looking forward to being able to pass on all the great things dance has brought to his life to his students.